April | 2014 | Jews Say No: Not In Our Name! Since I was a child, my family marked Holocaust Remembrance Day with reverence for the memory of the victims, vivid awareness of anti-Semitism and bigotry, and celebration of resistance and the Warsaw Ghetto uprising. I also had etched into my consciousness from an early age that in remembering the Holocaust and the history of anti-Semitism, we are obliged to re-affirm our commitment to fighting injustice in any form. With this in mind, as Holocaust Remembrance Day approaches, I can’t help but be appalled by the reckless charge of anti-Semitism directed at those who seek justice and who call out Israel for its human rights violations. When people criticize Israel (or any nation-state, for that matter), it is fair to challenge them – on the merits of the argument. However, Israeli government apologists instead shamelessly exploit the charge of anti-Semitism as a means of discrediting and obstructing those opposing its practices and behavior. These attacks, sometimes drawing upon classic anti-Semitic images as in Prime Minister Binyamin Netanyahu’s recent speech to AIPAC, have most recently focused on trying to thwart political organizing on college campuses, by both students and professors, in support of policies and time-honored strategies – like Boycott, Divestment and Sanctions (BDS) – intended to hold Israel accountable to international law and basic principles of human rights. Although this is certainly not a new phenomenon, these charges of anti-Semitism have become epidemic. There is a pattern: Israeli government behavior has gotten worse and worse, the movement to hold Israel accountable is getting stronger and stronger, and it appears the only way the Israeli government and its supporters think they can stop the momentum is to destroy the messengers, particularly since the facts of Israeli violations of human rights and the extent of its ongoing oppressive behavior against the Palestinian people are well-documented and pervasive. And these pro-Israeli government advocates know that there is no better way to shut people down and discredit them than by accusing them of anti-Semitism. These false calls of anti-Jewish hatred are an attempt to derail the movement for justice in Palestine/Israel and to destroy those supporting that movement. And, further, these trumped-up charges of anti-Semitism are particularly pernicious when directed at Palestinians or Muslims or others who already face extreme discrimination and racism. Calling criticism of the Israeli state anti-Semitic also makes a mockery of the term anti-Semitism and trivializes the memory of the Holocaust. Conflating anti-Semitism against the Jewish people with critiques of Israel as a state diminishes the seriousness of anti-Semitism when it occurs. As Holocaust Remembrance Day approaches, let us do justice to the memory of the Holocaust by recommitting ourselves to challenging injustice and to honoring, rather than demonizing and defaming, those who speak out and take action for peace and for justice in Palestine and Israel and anywhere across the globe. The author a community psychologist and educator, is a long-time organizer for peace and justice in Palestine/Israel. She was a co-coordinator of the 1989 landmark Road to Peace Conference that brought PLO officials and Knesset members together to the US for the first time. More recently, she was a founding member of Jews Say No!, is a member of the board of Jewish Voice for Peace, and is on the coordinating committee of the Nakba Education Project, US. New York, NY, April 22, 2014—On Earth Day, 70 human rights activists gathered on New York City’s Upper West Side outside the iconic Zabar’s store, demanding that SodaStream home carbonation devices be removed from the shelves because they are made in an illegal settlement in the occupied West Bank (photos; video). 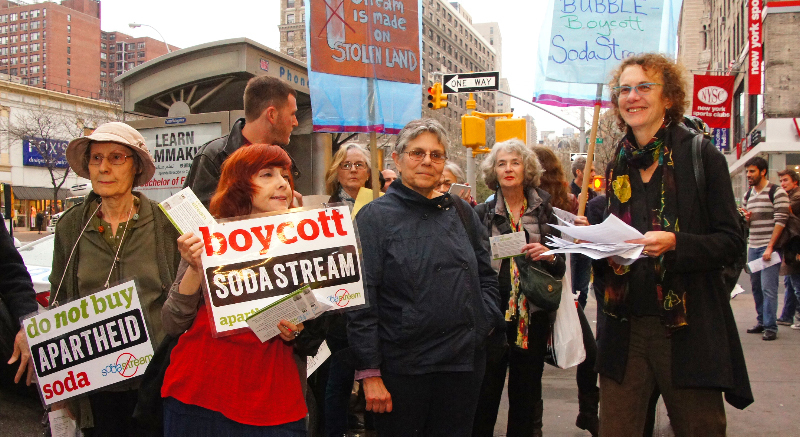 The demonstration was coordinated by the NYC Coalition Against SodaStream, which is made up of Adalah-NY: The New York Campaign for the Boycott of Israel, Jewish Voice for Peace—NYC Chapter (JVP), Jews Say No!, and Park Slope Food Coop Members for BDS. Tikkun: A Challenge to the Jewish Mainstream: Will You Stand Against Islamophobia? What’s the ideology undergirding opposition to the construction of mosques in the United States? How are anti-Muslim groups funded? How have Jewish groups reacted when confronted with issues like the proposed construction of thePark51 Islamic center near Ground Zero in New York City? Elly Bulkin and Donna Nevel answer these questions and more in their new book Islamophobia and Israel, a sobering analysis of the Jewish establishment’s dalliance with anti-Muslim bigotry. Based on a series of articles that I had the pleasure of editing before their initial publication on AlterNet, Bulkin and Nevel’s book takes a close look back at the summer of 2010, when the flames of anti-Muslim bigotry were fanned with vigor. It had been nine years after the September 11, 2001, attacks by a group of Islamic fundamentalists. But Islamophobia – collective animus targeting all Muslims – was still ingrained into swathes of the American body politic. And the Park51 Islamic center was exploited to bring that bigotry to the surface. When anti-Muslim bloggers like Pamela Geller first started railing against Park51, the name of the planned mosque and community center a few blocks away from Ground Zero, not many people noticed. But in a matter of months, concern over what was dubbed the “Ground Zero mosque” migrated from the fever swamps of Islamophobic blogs to Fox News. Then the rest of the mainstream press started paying attention. Ugly protests broke out. Heated debate captured the airwaves. The majority of Americans said they opposed the mosque. Here were two Jewish groups, ostensibly dedicated to tolerance and civil rights for all, opposing the right of Muslims to have a mosque near the former World Trade Center site. Given the history of anti-Semitism in the U.S., it was a curious stance on its face. But read Bulkin’s and Nevel’s analysis of the role the Jewish establishment and the Israel lobby have played in fueling Islamophobia, and it makes a lot more sense. In one chapter of the book, Bulkin and Nevel argue that the ADL’s opposition to Park51 is only the latest manifestation of the group’s Islamophobia. The group quietly opposed the building of a Boston mosque and joined in the smear campaign against Debbie Almontaser, who was forced to resign her position as founding principal of New York City’s first dual-language Arabic school after a months-long effort. The claim that Almontaser’s school would establish an Islamist beachhead would be laughable if it were not so effective. More recently, ADL head Abe Foxman justified the New York Police Department’s blanket spy program targeting Muslims, and the ADL honored former NYPD chief Ray Kelly, who implemented the discriminatory program, in March 2014. In addition to writing on mainstream Jewish groups’ complicity in fomenting Islamophobia, Bulkin and Nevel comprehensively document the funding stream connecting some Jewish philanthropic organizations – like the Fairbrook Foundation, the Becker Foundation, and the Rosenwald Fund – to anti-Muslim groups. Some of the same Jewish philanthropists, like former AIPAC board member Nina Rosenwald (of the Rosenwald Fund) and former Washington Institute for Near East Policy trustee Aubrey Chernick (of the Fairbrook Foundation), are key funders of illegal Israeli settlements. Given what they invest their money in, these funders seem to see support for Israel and Islamophobia as part of the same project. One aspect of that project is a tendency to view the Israel/Palestine conflict as the front line in a “clash of civilizations” between the West and Islam. Another key part of the project is attempting to demean a key political bloc – Arabs and Muslims – who are more critical of Israel than other ethnic groups in order to shore up American support for the project of Greater Israel, which funding settlements fortifies. As Bulkin’s and Nevel’s book shows, Muslim groups and allies opposed to Islamophobia are battling a well-funded machine dedicated to right-wing Zionism and anti-Muslim bigotry. But those opposed to Islamophobia in the Jewish establishment have begun to fight back. Bulkin and Nevel are a core part of their effort. They are both founding members of the Jews Against Islamophobiacoalition, a group composed of a few Jewish organizations that saw the need to unite. The coalition is the Jewish part of a multi-denominational effort against anti-Muslim bigotry. Their book will be a key resource for those looking to join this struggle. By offering detailed documentation and analysis of how and why powerful members of the Jewish establishment have stoked Islamophobia, the book lights the way for activists organizing against anti-Muslim bigotry. Alex Kane is an assistant editor at Mondoweiss.net and the World editor at AlterNet. His work has appeared in the Los Angeles Review of Books, Salon, The Daily Beast’s “Open Zion” blog, Vice, +972 magazine, and the Electronic Intifada. Follow him on Twitter @alexbkane. Posted in Uncategorized | Comments Off on Tikkun: A Challenge to the Jewish Mainstream: Will You Stand Against Islamophobia?